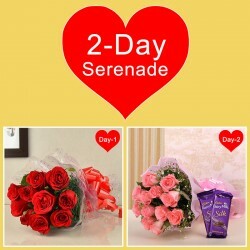 When one day is not enough to make your loved ones happy, our Serenade Gifts are what you should opt. Whether you want your surprise to last for two days or for an entire week, we can help you with everything. 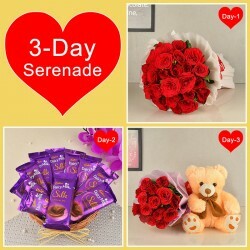 Chocolates, Cakes, Flowers, Teddy Bears; we have everything to make your surprise the best. When love blossom then sweet gesture means a lot, such like sending beautiful gifts to your beloved, conveying your love via flowers and delicious cakes, etc. But, if you want to do something unique, during entire valentine week, or on any special occasion, then you can go for serenades. 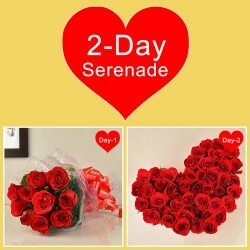 You can send serenades online to your dear ones via MyFlowerTree. 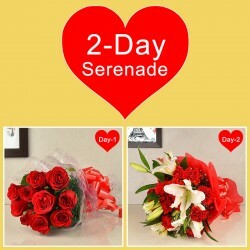 We have a wide assortment of incredible serenades for every special event to bring a smile on your sweetheart’s face. 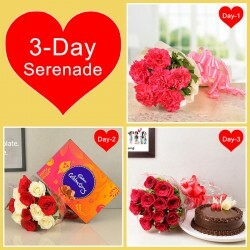 You can send 3 days serenades online to your beloved this Valentine week. 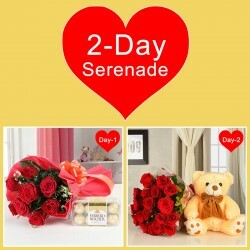 Your back to back surprises for continuous 3 days are sure enough to surprise your sweetheart. 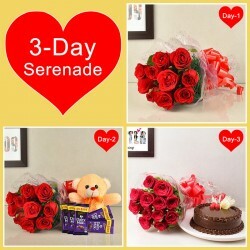 At MyFlowerTree, you can order perfect serenades for 3 days like our special serenade The red clique that contains 8 red carnations for day 1, for day 2 red roses with celebrations chocolate, for day 3 red roses and half kg black forest cake. 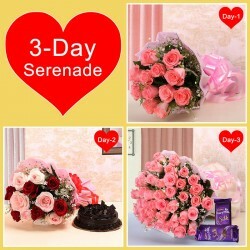 Another one is Strawberry love serenade that contains amazing hot pink roses for day 1, hot pink roses with strawberry cake for day 2 and pink roses with oriental lilies along with dairy milk for day 3. 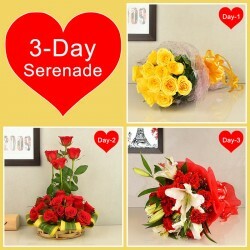 You can see our love tripling 3-day serenade that includes 12 yellow roses for day 1, 12 red roses for day 2 and white Asiatic lilies for day 3. 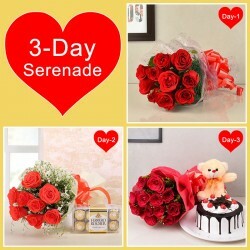 You can select any 3-day serenade with an amazing and beautiful combo for each day to convey your feelings to your favorite person. 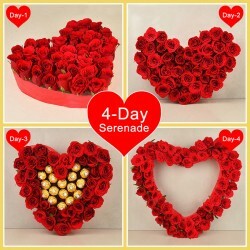 When planning to gift your beloved one any special day or on valentine day, then go gifting beautiful serenades for the 5 days of valentine day. Now it is possible from the comfort of your home. 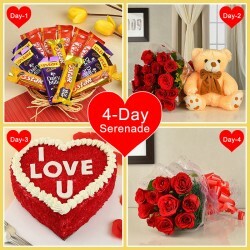 You can pay the price once and get amazing gifts delivered for 5 days. 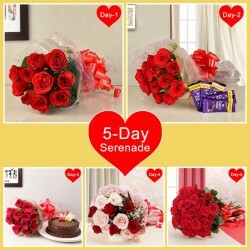 You can choose our dazzling 5 Days Serenades online of love freshness that includes day 1 red roses in red paper, for day 2, eight red roses with five Cadbury dairy milk chocolates, for day 3 red roses, with dairy milk chocolates and half kg chocolate truffle cake, for day 4 eight red roses in glass vase and for day 5 , fifty red roses in white and red paper. 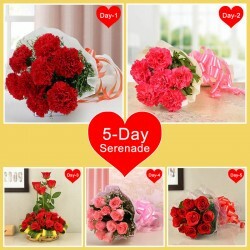 Another gorgeous serenade of ours is Steps of Love in which you get 8 red carnations for day 1, pink carnations for day 2, yellow roses for day 3, 8 pink roses for day 4 and 8 red roses for day 5. We assure a fresh, beautiful and ultimate range of enormous serenades at your dear one’s doorstep for a complete five days. 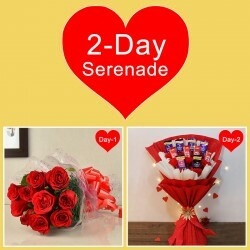 Valentine week is starting, and nothing can be more interesting than sending serenades from MyFlowerTree for each day of love week. 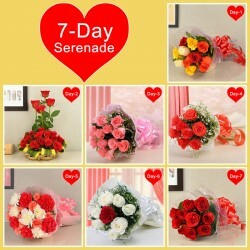 You can surprise your loved ones with this amazing serenade which contains unique gifts for all 7 days, such like a complete package of 7 wonders includes, Assorted Roses for day 1, eight Yellow Roses for day 2, eight pink roses for day 3, eight Orange Roses for day 4, eight Pink and Red Roses for day 5, seven White Roses and 1 Red Rose for Day 6 and 8 Red Roses for day 7. 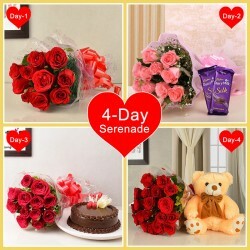 This 7 days serenade online, will definitely be an unforgettable gift for your beloved. Products in this category have been rated 4.7 out of 5 based on 142 reviews.